World Champion Good Reason Sa passed away unexpectedly. WAYNE, OK�SEPTEMBER 27, 2012�The 2011 World Champion Aged Horse Good Reason Sa has passed away unexpectedly. 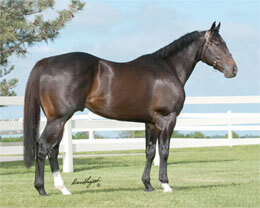 The 2007 son of Favorite Trick TB, out of the blue hen mare Queen Of Appeals stood to a full book of mares this year at Royal Vista Ranches near Wayne, Oklahoma. Good Reason SA had a bright future ahead of him because of his outcross pedigree, excellent conformation, and $1.4 million in race earnings. The connections of Good Reason Sa are all very saddened by the passing of this outstanding horse. Cause of death has yet to be determined.